Want to know how the Westford, Massachusetts real estate market is doing? 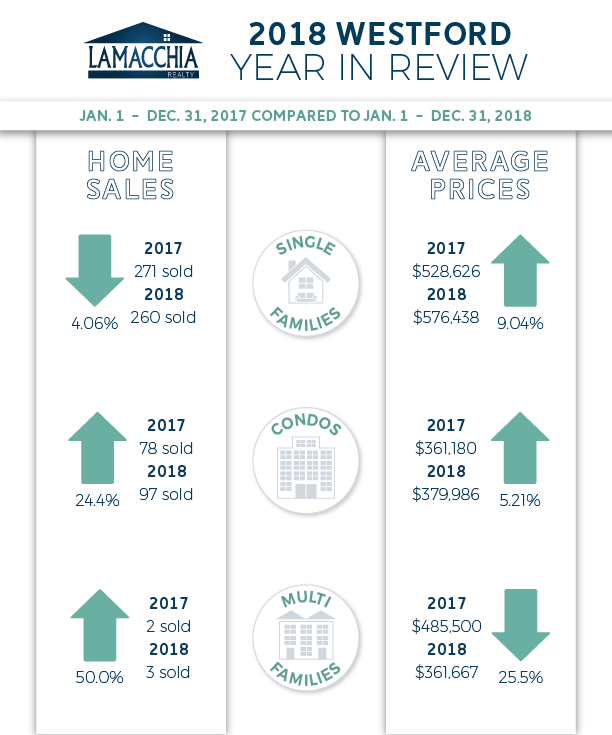 In this 2018 Year in Review Housing Report, we’re looking at home sales in Westford for 2018 compared to 2017 and how the market is currently performing in that area. As of December 31, 2018, there was a 2.56% increase in home sales, with 351 in 2017 now at 360 in 2018. There was also an increase in average prices, $448,026 in 2017 increased to $465,263 in 2018. These metrics include single families, condos, and multi-families. Westford experienced a 12.4% increase in the number of homes listed on the market in 2018. There were 351 in 2017 and 360 in 2018. Westford put 6.21% more homes under agreement in 2018 with 342 compared to 322 in 2017. To learn more about how Massachusetts and New Hampshire performed in 2018, click here.